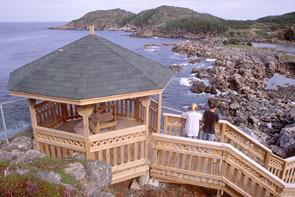 Photography of Wildlife & Natural Areas of Newfoundland, Brighton Lookout. Overlooking the Cobler island causeway and the open waters of Notre Dame Bay where icebergs transit in spring. The rocky innapproachable shoreline, covered with stubborn wind twisted tuckamore is made accessible by boardwalks offering a rare glimpse to hangashores.